There's been a lot of hype lately about Sheila G's Brownie Brittle (well at least in the foodie world) and I was lucky enough to have a few bags sent to me for sampling. My first impression of these wafer thin snacks was a good one. I mean how can you go wrong with something that tastes like a brownie but has the crunch of a chips. What's even better....it comes in flavors. So you can enjoy such tastes as, salted caramel or mint chocolate chip. And while these wonderful little bites of chocolate goodness are enough on their own I just had to push it a little bit. Mixed with some melted chocolate and poured over fresh popped popcorn these brownie edges are totally irresistible. Melt chocolate microwave until smooth. In the meantime crush brownie brittle by hand. I suggest leaving it on the larger size. 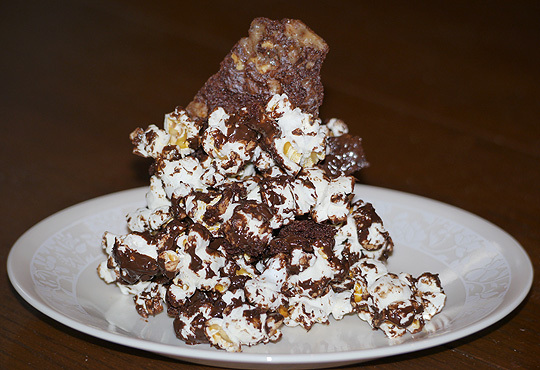 Mix brownie brittle with popcorn. Drizzle melted chocolate over top and stir to combine.